Art & Frame of Sarasota: The New Escoda Reserva Travel Brush Set! The New Escoda Reserva Travel Brush Set! Escoda Reserva Travel brushes are made with the best hair for watercolors, Kolinsky-Tajmyr Sable, from the Tajmyr region in northern Siberia. Because only the best Kolinsky male sable hair is used, the brush has a perfect point and an extraordinary capacity to retain liquids. 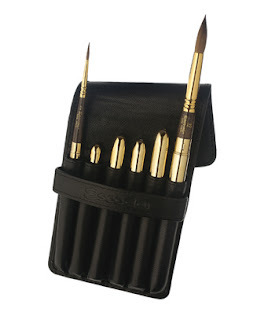 The Reserva Travel Brush Set contains 6 travel brushes in sizes 2, 4, 6, 8, 10, and 12 secured in an attractive leather wallet. If 6 brushes are just too many, try Escoda's Charles Reid Set of 3 Reserva Travel brushes in sizes 6, 8, and 10. 40% off Gamblin Paints - in Store and Online! New Montana Marker Colors & Sets!